Service operates between DART Central Station and Valley West Mall, including destinations at Windsor Heights Walmart, Drake University, Department of Human Services and Children & Family Services. 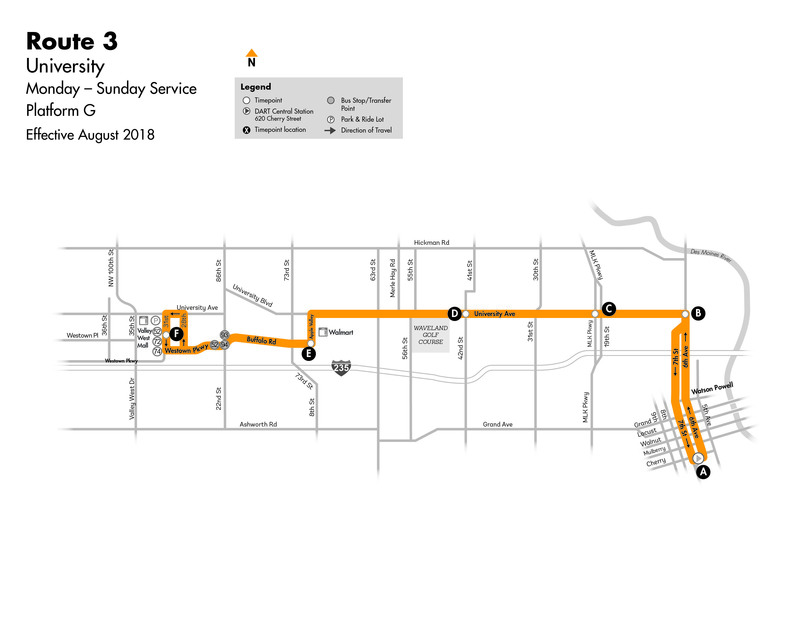 Connections: Local Routes 14, 15, 16, 17 and 60; Express Routes 91 and 92 along University Avenue. Crosstown Route 52; Flex Route 72 and 74; Express Route 94 at Valley West Mall. Express Route 93 at Westown Parkway and 22nd Street. All Express Routes and the D-Line Shuttle on Grand Avenue and Locust Street in downtown Des Moines. All Local and Crosstown Routes at DART Central Station.